The Big Short is directed by Adam McKay, who typically has done comedies in the past (Anchorman) — so a serious movie such as this one is a bit atypical to what he has done in the past — but he does a pretty good job. 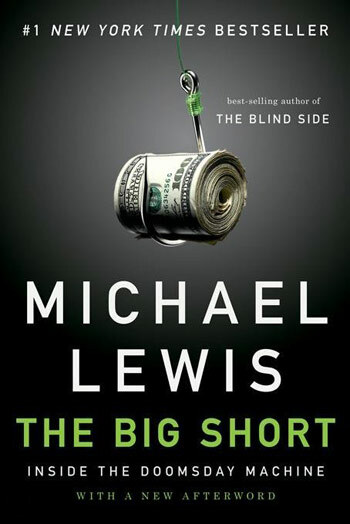 The movie is actually based off the book with the same title by Michael Lewis that was published during the financial crisis. I read the book and also watched the movie. Additionally, I worked as a hedge fund and investment bank trader during the financial crisis, so a lot of the story relates really well to me. When I read the book, I was blown away by all the details and drama of what was happening. So I came into the movie with pretty high expectations — especially as it relates to the character development of Michael Burry M.D. (played by Christian Bale). More on that further below. 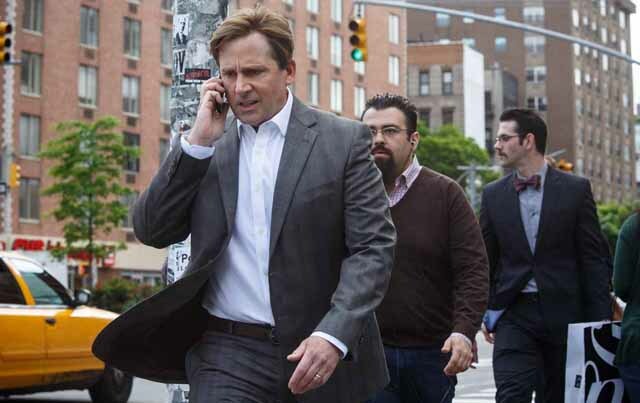 But for now, let’s talk about the Steve Carrell — who I thought played an outstanding role. Honestly, I could I picture Steve Carrell — who typically does comedy stuff like The Office — as a disheveled Wall Street manager who struggles with the morality of the whole system and what his role is within it. Because I read the book, I knew what the story was about. When I saw the trailer — man, it was awful. I think I were the average person who is not involved in the finance world, I would just turn away. But since I am a trader and I was deeply involved in the trading aspects of the financial aspects of 2007-2009, I had to see the movie. To save some money, I saw the matinee version to save some money on a Saturday morning. 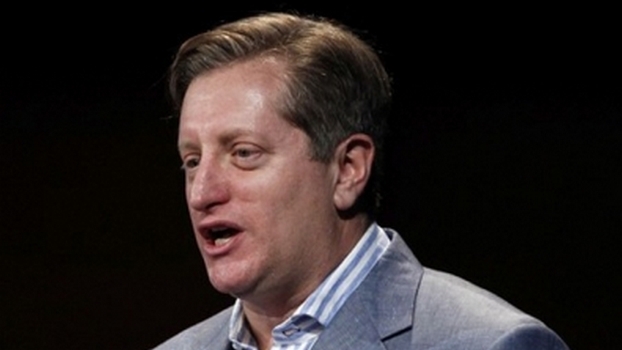 Steve Carell as Steve Eisman, a hedge-funder who shorted the market spectacularly during the crisis. Basically, Carrell plays this Jewish guy who grew up questioning the system. When he was young, his rabbi complained to his mother about the motivation behind why he was studying the religion so hard –saying that his motivation was to find faults in the words of God. Later in life, this has developed into questioning the financial system. When banks ripped off customers and made money, that would really piss him off. He has a really strong conscience and the ugliness of Wall Street really bothers him. Steve Carrell did an extremely outstanding job — beyond my imagination — of representing a hedge fund manager housed under Morgan Stanley. The mannerisms, the facial angst when confronted with moral ambiguity, the inquisitive nature in which he tried to dig up information — everything from questioning strippers, to talking with the guy on the other side of his trade — really some deep stuff. Wife: Mark, you hate your job. Mark: I love my job. Wife: You hate your job. What a great representation of what is often true about people on Wall Street. I used to work on Wall Street — and yea, there are a lot of shady people there. There are also some good people — and they struggle being there, but aren’t able to break away. I think by phrasing it as they love being in an unhappy area — kind of illustrates how torn some of the people are. On the one hand, the financial system is so large and global that it’s exciting to be a part of it. On the other hand, you know the system is f*cked up — and you’re partly just there making it worse. I really, really thought Steve Carrell’s performance was beyond my imagination — and strongly believe he deserves to an Oscar for his performance — especially because the role is uniquely different from the more comedic roles he has played in the past. I thought it was great how in the movie – they would have Ryan Gosling point out which parts of the scene were actually true or false. For example, the fact that Mark Baum was at some conference on the stage with some legendary investor who said to buy Bear Stearns — and Mark knew things were going to sh*t — how he behaved on stage was rather compelling. Rather than bragging that he was right — he gave a speech about how this country is f*cked and that he has no joy in knowing that he is right. It really meshed well and was consistent with his character. So Christian Bale plays the role of this doctor guy who dropped out of medicine because it was too boring for him. He’s super smart, but socially awkward — largely because he had a fake eye due to an infection when he was young. He had trouble talking to girls growing up or even being socially included—largely because that fake eye that would pop out here and then and scare the krap out of his peers. But he was really smart and went the medical route but dropped out because he was really good at picking stocks and was making a killing. Big guys like Vanguard and Joel Greenblatt were interested. So he started his own fund in late 2000/early 2001. By the end of 2004, he was managing $600 million and had to turn money away. In 2005, Burry wanted to short the subprime market — but since there was no existing way to do it — he went to Goldman Sachs to ask them if they could create a custom bet for him. I thought the character development part of this character in terms of the script is where the film was lacking. I came into the movie with a high expectation for the character development of this Burry guy — since in the book, I was really intrigued by this guy. Everything from how he grew up — his journey through medical school and how that fake eye haunted him for life — I thought the film could go really deep here. Instead, the movie only briefly touched upon it. Now, I understand there’s only 2 hours to a movie and so much you can fit in — but I really thought the character development in the book was really good and that could’ve added a bit more depth in the movie. I thought the character focus in the movie was more on Mark Baum (Steve Carrell)—with the whole moral conscious thing, whereas the character focus in the book was stronger on Burry. Also, I think there was too much emphasis on the heavy metal music during the movie with Burry wearing headphones and off in his own world. A little is fine to show character — but I thought that part was overdone. Phenomenal – I’m amazed at how versatile and adaptable Bale is to the role he plays. He can play everything from superhero Batman to socially awkward hedge fund manager Michael Burry. I guess he could be considered as a Supporting Actor role in this movie — under Steve Carrell–but all the awkward ticks, facial expressions, frustrations during the time when he was losing money month after month and his investors wanted their money back and the pressure was on — Bale gave a very believable performance. As a trader, I am well aware of the emotional swings that can take place when you are winning or losing a lot of money. When a trade goes against you — and the pressure is there but there is that conflict of thinking you are right, but the market is saying otherwise –is a very familiar feeling. The struggles that the characters goes through is a feeling that is universal for all traders as all traders have experienced this at one point or another. And I thought Bale brought that vividly out in the movie. Did you know Michael Burry graduated UCLA in 1993? Here’s his UCLA Economics Commencement in 2012. Actually, he sounds a lot more eloquent than I expected–especially for speaking in front of such a big audience. And I actually can’t really tell which of his eyes has issues — so I think that’s really good in terms of how medicine has has progressed. Michael Burry really had an unfair life. When he posted an OpEd in the NY Times about why the Fed didn’t foresee this, instead of engaging with Michael Burry in a collegial discussion, they instead audited all his funds and had the FBI investigate him. Talk about how corrupt the American political and financial systemis. This part I didn’t think was done well. Yes, Margot appears naked in a bathtub of bubbles overlooking some floor to ceiling window with some modern looking view. But her explanation of mortgage bonds was horrendous. I know the purpose of having her in the film was to make the audience believe that well, if she gets it, then it must not be that hard to understand. Well, after listening to her explanation, I perhaps got further confused. I think they should’ve trained her or changed the script of how she explains what a mortgage bond is better. But hey, can’t complain too much to have a naked scene in the movie. I thought the scene with Anthony Bourdain was much better received and understood by the audience. What is a synthetic CDO? Synthetic CDO — is basically a bunch of leftover seafood that you can’t really sell as a restaurant owner — so you dump it all together into a pot — add boiling water — and now you have seafood stew soup. You can still sell this soup for a good price — because people’s perception is that wow this is seafood soup — it’s high quality. Same thing with a synthetic CDO — you have all these bonds rated AAA, BB, BB-, etc — as an indication of how likely borrowers are to pay back their loans. The krappy ones — the ones that people are least likely to pay back — are all bundled together, thrown into a pot and wrapped together in a legal document that describes them collectively as a synthetic CDO. Now, these previously low-valued bonds are “perceived” as high value. Well, there’s one last thing missing — you need a ratings agency — people who put a rating on these synthetic CDOs. They need to rate it as AAA (high quality) — even though inside is krap. How do you do that? You pay the ratings agencies like S&P or Moodys to publish a report that says this seafood stew soup is AAA — and now you can sell it to investors. So that’s the premise — hide all the junk so the investor or customer doesn’t really know it’s leftovers — but price it to them as if it’s high quality stuff. That’s a synthetic CDO. A credit default swap is basically insurance –betting that a CDO will or won’t go bust. The person buying the CDS insurance (Michael Burry, etc) — believes that the underlying CDO will go bust. If it doesn’t, he loses money every month (has to pay a monthly insurance premium). But if it does go bust, then he gets a big payout — up to 25:1. Selena Gomez talked about this and then also talked about side bets. In Wall Street, you can customize legal contracts to make any kind of bet — so people would make side bets — betting that the person who bet that Selena would win a black jack hand — that that person would win or lose. And usually the amount would be even larger. So you have these bets — that someone else betting would win or lose — a bet on a bet on a bet. And when Selena finally loses her blackjack hand to the dealer — then the whole domino effect happens and all those people who participated in the bet the wrong way loses. Of course, she was sitting next to economist Dr. Richard Taler — I think the only real expect who appears in the movie. So Who Gets the Oscar? Both Steve Carrell and Christian Bale did outstanding jobs. I would say I was least impressed by Brad Pitt –and then Ryan Gosling. To be fair to Brad Pitt — it’s possible that the character he played — some ex-WallStreeter who was relatively quiet — didn’t allow him to shine bright. So it’s partly the character. 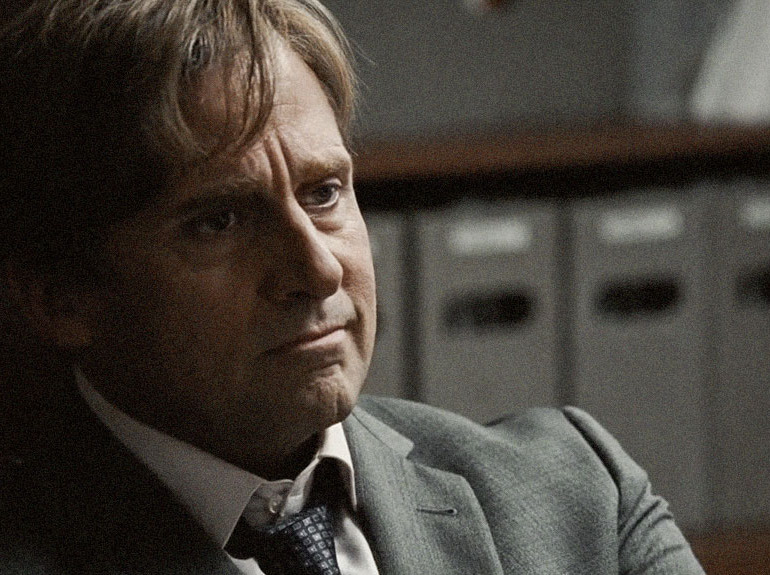 Overall, it’s a tough Steve Carrell I thought went above and beyond — so I would say he should get the Oscar. Is the Next Big Short Opportunity Coming Up? Well, with the stock market these days way way higher than where we were during the financial crisis — there are still a lot of fundamental issues within the economy. I believe the wave patterns in the stock market since the financial crisis can give us big clues as to when the next “big short” will be. Here’s my analysis of the 2015 S&P stock market and my outlook for 2016. I do believe a big short opportunity is upon us now. You see, even with all uncertainty and news events such as the Lehman Brothers collapse, Bear Stearns collapse, the Fed stepping in, the Fed not stepping in, news headlines running crazy here and there — if you look at the pattern of how the stock market fell from the highs in October of 2007 to the March lows of 2009 — it actually follows a common Elliott Wave pattern. 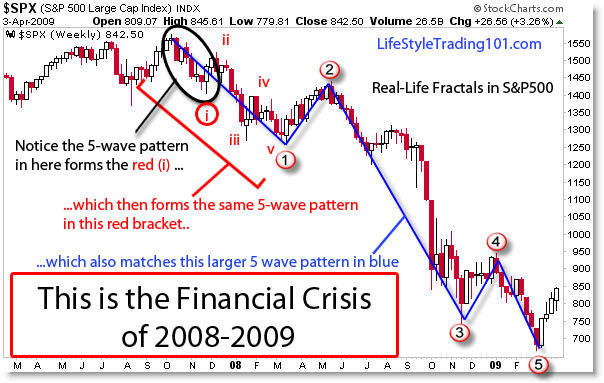 The financial crisis was basically a 5-wave pattern that developed off the highs. Kind of like Inception, the Movie, which introduced the concept of a “dream within a dream” to the general public — with stock market we have something similar — patterns within patterns. 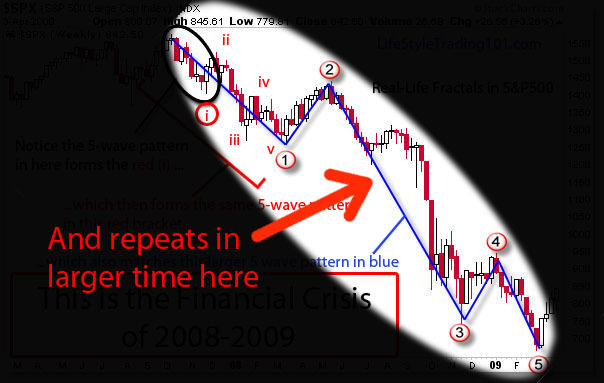 This fractal nature of the pattern is the basis of what is called Elliott Wave Theory — something we use extensively here to generate consistent weekly income from the stock market. You can see our daily analysis by subscribing to our daily blog updates. 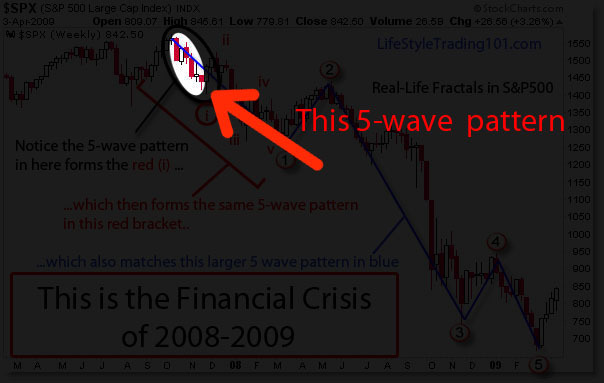 If we knew about how this 5-wave pattern could potentially be within a 5-wave pattern — then when that first small 5-wave pattern appeared from the top of October 2007 — could we have more accurately predicted when the larger 5-wave pattern would complete — and therefore predict when the downside movement would be done? The tricky part is having confidence that the 5-wave pattern would indeed play out as expected. 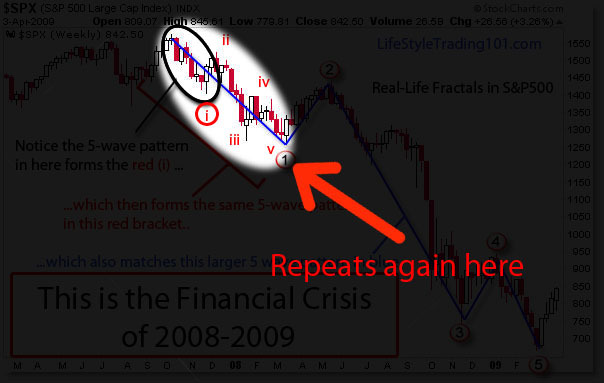 But if you go back through time and history — these patterns repeat over and over again—despite whatever geopolitical or global financial news that happens — the structure of that pattern is predictable to some extent — using Elliott Wave Theory and pattern recognition. I believe the next Big Short opportunity is upon us — coincidentally as the Big Short 2015 movie is launching. How exactly it will play out will be interesting. I don’t think the pattern will be exactly the same pattern we see above. 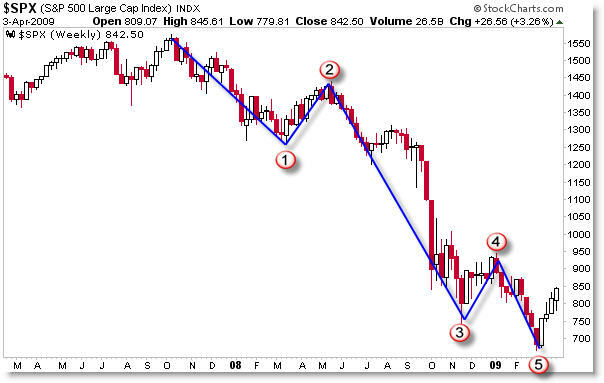 Instead, there’s another pattern from the Elliott Wave Playbook that I see playing out. I’ll be writing about it in my S&P500 Elliott Wave Trading Blog Entries and my weekly iTunes podcast. Really excellent job from Steve Carrell — makes me want to read the book again. Looking fwd to watching the movie. About to go in. I did see the trailer and didn’t think too much, but this write up seems pretty inspiring. I didn’t know Selena Gomez would be in there? Really? I saw the book already, hope this movie is worth it. It’s one of the hardest type things to explain but they got sit some big name actors – many of whom I barely recognized. Yes, Selena is definitely in the movie. We weren’t able to grab a clip of the exact scene for this post, but she explains the bet on the bet.